A maintenance company you can rely on! As our loyal commercial customers can tell you, whether it’s fixing a small leak from your hairdresser’s basin or the installation of your hotel’s new kitchen, we can guarantee a specialised, courteous and reasonably priced service. Shops, bars, restaurants, schools, warehouses, fast food outlets, care homes, offices – the list goes on and on! Our experienced electricians, plumbers, heating engineers, drainage specialists and locksmiths are available 365 days of the year and can be at your premises within a couple of hours of your call. Alternatively, we can arrange an appointment convenient for you and your business needs. Does your business need a maintenance company you can rely on? As our loyal commercial customers can tell you, whether you need more plug sockets in your hairdressers or an installation of a new kitchen in your hotel, we can guarantee a specialised, courteous and reasonably priced service. Shops, bars, restaurants, schools, warehouses, fast food outlets, care homes, offices – the list goes on and on! Wherever we are needed, we will get the job done right, and done right first time! Our highly professional electricians are fully qualified, fully insured and pride themselves on the high quality of their work. They’ll guide you through the work they’re carrying out, discuss any electrical installation or repair options in full and always tidy up after themselves. Furthermore, all parts and labour come with a full guarantee for your complete peace of mind. Do you suspect there may be a fault with your business’s electrics? Many electrical problems are often caused by issues with internal wiring, fuse boards or circuit breakers. Fortunately, our highly qualified electricians are the experts in inspecting commercial electrics, and can identify potential faults quickly and efficiently. We can supply and fit new fuse boards where necessary and can repair and rewire faulty internal wiring, ensuring your business is left safe and worry-free. Electrical work can be dangerous and work should only be attempted by registered electricians who have the relevant skills and tools to complete the work safely. 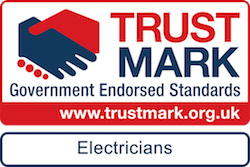 As well passing our stringent vetting process, our electricians are highly experienced, fully qualified, fully insured and accredited by industry organisations such as NICEIC, ELECSA and NAPIT. All this means you can rely on us to do the work safely, professionally and with care and skill. Is your fuse board tripping for no apparent reason? 9 times out of 10, a tripping fuse board is doing its job correctly – protecting you, your staff and our customers from potentially dangerous electrical faults. If your fuse board is tripping often, this could indicate an electrical problem, such as inadequate wiring or a faulty appliance. Our fully insured expert electricians can inspect your electrics and advise you on exactly what’s causing the fuse board to trip. We can also increase the electrical capacity of your fuse board to support additional appliances such as showers, boilers and cookers. Call us now!